Super lightweight platinum blonde yarn dread falls! Great for gothic, steampunk, Larp, tribal fusion belly dance and other costuming, discounted price for Halloween! Extra long hair fall, M extra, wavy hair, 90-100 cm/ 36-39 inches long and ready to ship in color 8. Extra long bollywood & Goth hair fall, L extra, wavy hair, 100 cm/39 inches long. Ready to ship in color 4, mocca. Dark brown peacock feather extensions as fancy diva hair jewelry! Wear these hair pieces in long and in short hair! 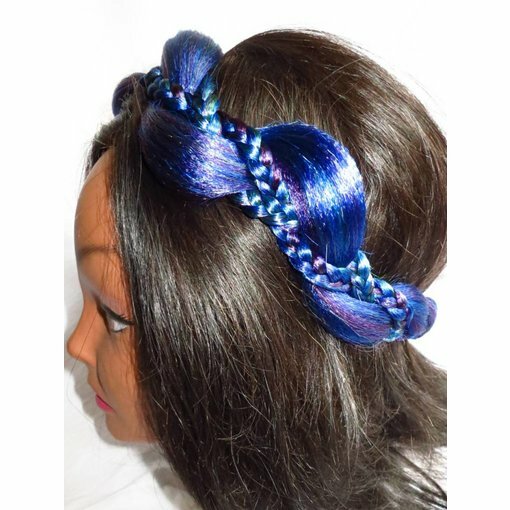 Braided fantasy headband mermaid in the colors of northern lights - a highlight mix of deep purple, blue and turquoise! Rapunzel fantasy braid, 50 cm/ 20 inches long. Ready to ship, hair color 1001 0 platinum blonde, professional & safe attachment. High quality kanekalon hair. 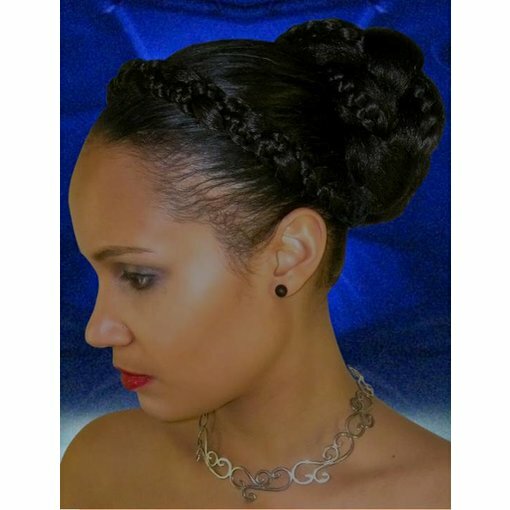 Supersize Fantasy Braid, deepest black for your Goth Diva styling! 50 cm/ 20 inches long plait, about 180 grams light and makesa gorgeously lush bun! Straight hair fall, size L, in fair blonde, 55 cm/ 22 inches long. Made of high quality kanekalon hair and ready to ship. 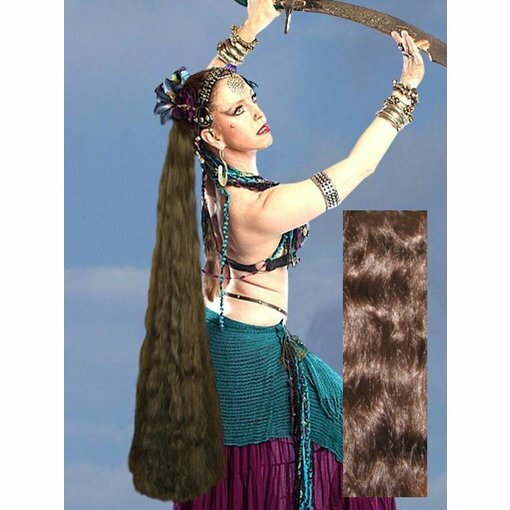 Steampunk & tribal fusion belly dance hair extensions with belly dance buttons in gold. 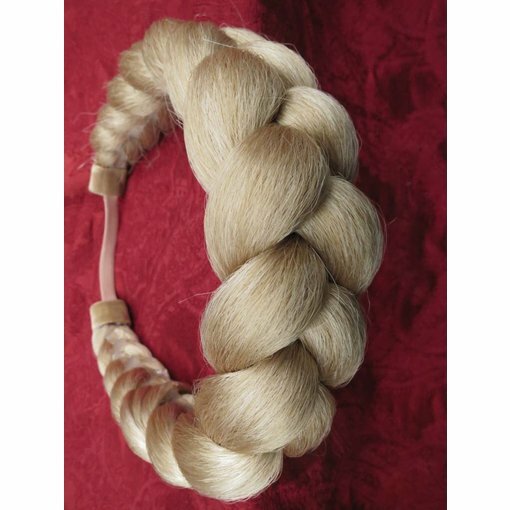 Fair blonde Supersize Fantasy Braid & Bun, 50 cm/ 20 inches long plait, about 180 grams light. Made of high quality kanekalon hair. 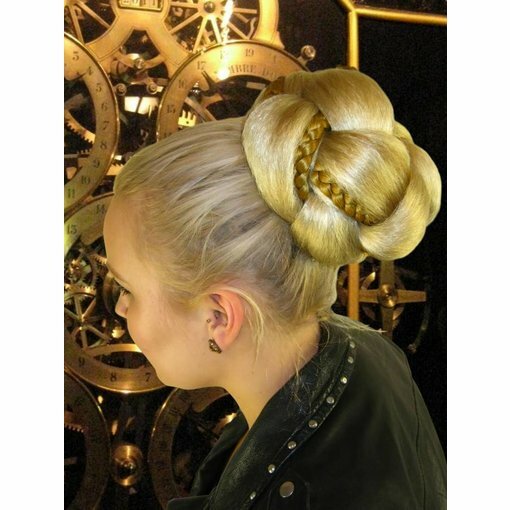 Supersize lush braid hairband for Medieval and Renaissance looks, boho stylings and as rustic wedding hair. Ready to ship in a fine highlight mix of colors 22 and 24! Ready to ship hair accessory, braided hair piece for instant hairdos, braided updos, wedding & prom hair styles. Made in blondes 22 and 24 in a fine highlight mix. Braided headbands ready to ship in color 3, very dark brown. Hair accessory, hair piece for instant hairdos, braided updos, wedding & prom hair styles. 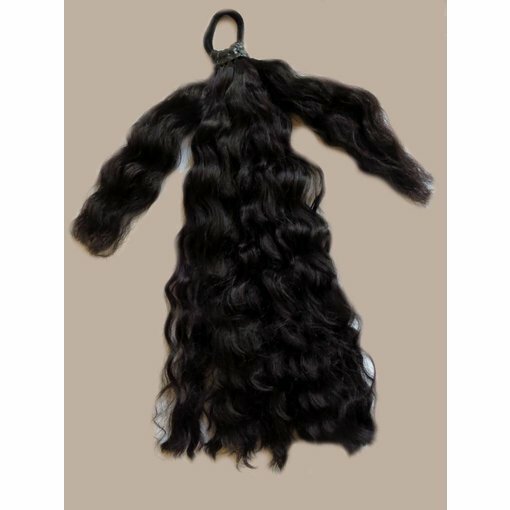 Very dark brown hair fall, size M, natural curls, 55 cm/ 22 inches long. Made to order in every hair color, 2 attachment options. High quality kanekalon hair. 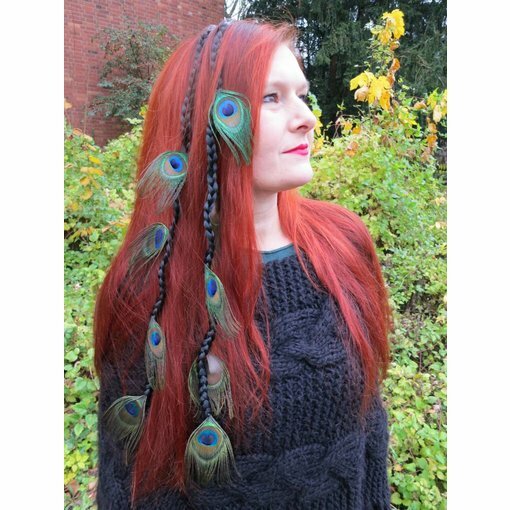 Peacock feather extensions as hair jewelry for weddings, larp, cosplay, gothic, steampunk... Wear these hair pieces in long and in short hair! Braided braid headband in very dark brown with floral bronze ornaments - great for boho and steampunk stylings! Ready to ship! Curly hair falls in deepest black, size M, natural curls, 55 cm/ 22 inches long. Ready to ship and highest quality kanekalon hair. 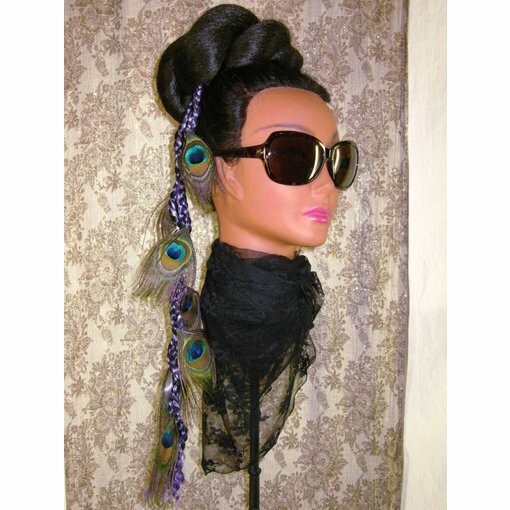 Black Goth peacock feather extensions as dark diva hair jewelry! Wear these hair pieces in long and in short hair! Purple-black peacock feather extensions as fancy diva hair jewelry! Wear these hair pieces in long and in short hair! 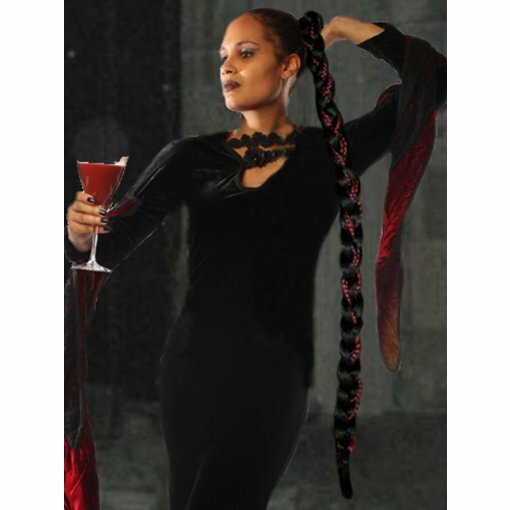 Wine red & ivory Goth feather extensions for black hair! 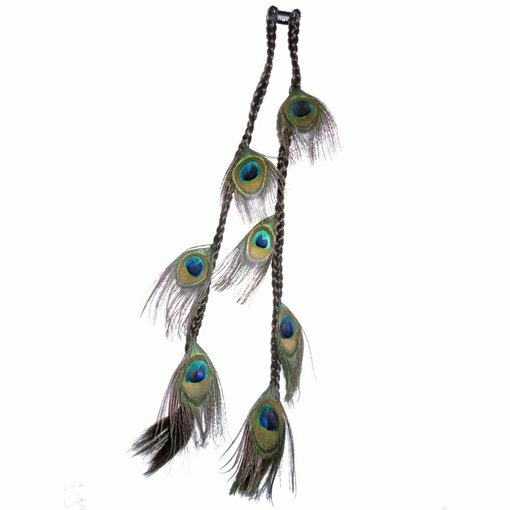 Wear this ostrich hair jewelry in long and in short hair! Custom color Rapunzel Braid, 90 cm/ 36 inches long in deepest black with wine red interwoven braids in the braid. Special offer! Custom color Rapunzel Braid, 90 cm/ 36 inches long in deepest black with wine red interwoven braids in the braid. Special offer with 25 % discount! 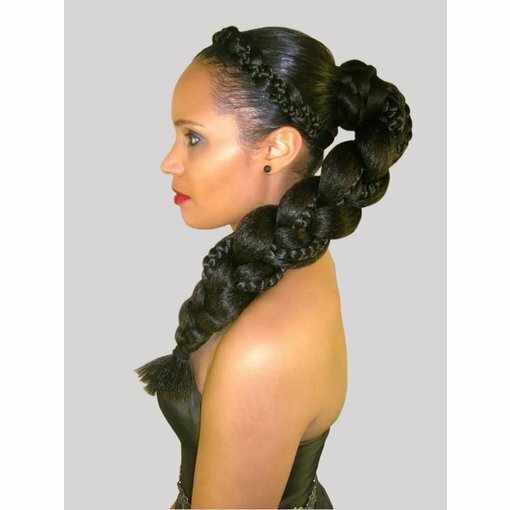 Supersize Fantasy Braid, deepest black for your Goth Diva styling! 50 cm/ 20 inches long plait, about 180 grams light.